The airport is currently operating at double its capacity having received 3.3 million passengers already this year. Privately-owned Cam Ranh International Terminal JSC (CRTC) on Thursday began construction on a project to expand and upgrade the crowded Cam Ranh International Airport in the central province of Khanh Hoa. Total investment for the new international terminal is VND4 trillion ($178 million), and it will be built in the shape of a swallow’s nest, the symbol of Khanh Hoa. The first phase of the project, at which CRTC hopes to begin trial runs in March 2018, is designed to handle 2.5 million passengers/year. The capacity will be raised to 4 million passengers/year in the second phase and 8 million passengers/year by 2030 when the third phase is completed. 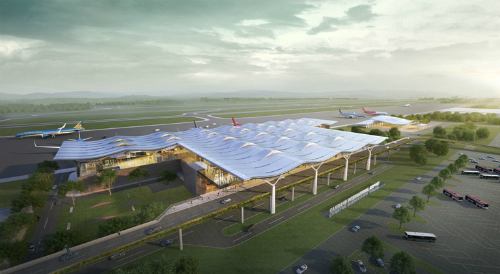 In the first phase, 40 check-in counters, 10 boarding gates and other relevant infrastructure will be built. The airport was originally designed to receive maximum of 1.5 million passengers per year but it has been overloaded in recent years with passengers passing 2.7 million in 2015. Earlier this year, the airport was upgraded to handle 2.5 million passengers/year but it remains overstretched having received 3.3 million passengers already this year, including 1.5 million foreign visitors. A design of the expansion project. The recent sharp rise in the number of passengers traveling by air within and to Vietnam has also put more strain on Tan Son Nhat and Noi Bai, the country's two major international airports. Tan Son Nhat in Ho Chi Minh City has the capacity to handle 25 million passengers but is expected to welcome 31 million passengers this year, according to Lai Xuan Thanh, director of the Civil Aviation Authority of Vietnam. Meanwhile, the domestic terminal at Noi Bai in Hanoi had to handle about 12 million passengers last year, much higher than its designed capacity of 8 million.